This recipe is from my Aunt and it has been a family favorite for generations. I hope you will enjoy it too. Set oven to 350 degrees. Mix cake, pudding (dry), 1 Cup of Orange Juice and oil. Prepare an angel food cake pan with spray and flour. Bake for 30 minutes or until toothpick comes out clean. 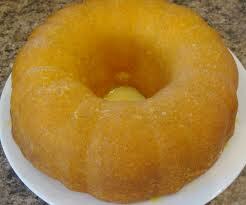 Glaze: Mix in saucepan the 1 stick of Butter, 1 Cup of sugar and 1/2 Cup of Orange Juice. Bring to a slow, low boil. Spoon over warm cake. Let stand 30 minutes then turn out onto serving dish. I can’t believe you actually have this recipe. It’s the makings of fond childhood memories at Aunt Receye’s house. It will be in the oven in 20 minutes. Guess what’s for dessert tonight? I’ll let you know if it equals the memory. You may not know this but Aunt Recye guarded this and a few other “secret” family recipes too! My Mom has her recipe for the Polynesian chicken wings that AR made, but Mom won’t give that one up! I found an old envelope, about a month ago, that Aunt Recye had written several of her recipes for me. It was wonderful to see her recipes and her handwriting after all these years. You know, Lisa & I really loved her alot. And I know she loved us too. She was more like a Grandmother to us than an Aunt and I cherish my memories of her. I also have her recipe for her Fruit Cocktail Cake and a Vanilla Wafer Cake that she was famous for. I will be posting those sometime soon. I hope your OJ cake comes out great and brings back wonderful memories for you too Cindy. Let me know how it turns out!